The other day I brought this sock and its mate (and many of their friends) up from the drying room and set it on my bed to put away. I nearly put them on... but they're my favourites on a cold day and since a colder one was due I thought I'd save them, so I put on a green pair instead and wandered off to start some tea. Sometime between then and when I finally did go to put the socks away, the mate to this sock vanished. I've got the remaining sock on my desk, reminding me how I finished the pair for my birthday last year, willing me to keep looking. But I've even vacuumed all over and under every piece of furniture in the bedroom and there is no sign of it. I mean, HONESTLY. 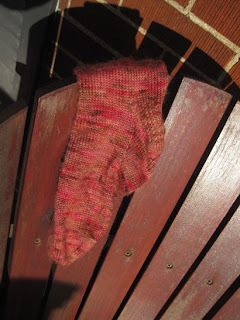 We all know that socks invariably go the way of dryer vent monsters, but handknit socks that get hung to dry and escorted back to a nice safe room? Shudder. If you happen to notice a sock like this one hitching a ride through your town, let me know, wouldja? 1) Stuck to, or inside another laundered item (static can do that). Check fitted sheet corners, towels and anything acrylic. I occasionally pair socks incorrectly especially in poor light. Double check the sock drawers. 2) Hiding in bed if you threw the laundry on the bed before making it. Check under the bottom sheet too. 3) Did you stop sock folding to answer the phone in another room? 4) In the fridge. For some reason I don't understand I occasionally put really inappropriate things in there mindlessly (cell phone). Not socks, so far, but anything is possible. 5) Mixed up with holiday bows or decorations. Those socks could easily lurk in some pretty red bows that have been stowed. keep us posted. QualityWatch hit on all the good places. Also check the cat's things. The sock is quite possibly stuck to something that got shoved into my closet, but finding out will cause an avalanche so I'm saving that particular hunt for tomorrow. Definitely not in the 'frig though! !